I could see that. I don't know about Rijkaard (haven't used him) but Seedorf is the perfect compliment to a slower, stronger mid. He's like the glue or engine of the midfield. Got 88 Seedorf for 976k just now. I liked the Base version so giving the middle a go seems like a good idea. Tell us how you like him! What a troll. I don't even know who 'Watkins" is? Going back back in on Weekend League.... Again! Can’t believe I haven’t been on this thread this year till now. Team’s looking great! Thanks, mate! Not sure what to do next, tbh! How you doing this wl James? Team doing bits for you? I’m tempted by toty Mbappe but that’ll be at the detriment of getting another icon in my line up so I’m hesitant as I’ve got the nif at rm anyway. I've kind of changed my goals for WL due to personal circumstances (all good news, btw - just busy). I'm just shooting for 6 wins every other week. That way, I get a shot at a red (and last week, my first with only one red, was my highest red card pull ever - go figure) but also don't feel the pressure to keep playing all weekend. I get some added DR points, and then can play the 12-15 games of DR over the ensuing 12ish days to have another run at it. Anyway, I'm like 2-1 right now, but thankfully have some time today to play more. As for Mbappe, don't hesitate. He's a monster. If you're playing him RM, first of all, you're crazy (I did the same - it's not that it doesn't work, he's just much better at striker). But, secondly, it might not matter nearly as much. What I can tell you is that up top he is as strong, fast, agile, and nasty at shooting as pretty much anyone in the game - near Eusebio level. You should definitely give him a try if you get a chance. Thanks for checking in! How's your WL? Cheeky bugger, I see you're on 17 wins already!!! Fair play, I wish I could just play casually but I too have been sucked into the weekend battle for rewards. I’m glad you’ve shaken off the addiction of wl though! As for Mbappe,he’s there as I have Raul and he’s just been too good for me to bench. Honestly though, nif Mbappe is alright but not outstanding, although I can imagine just how good the toty is. My current quandary is 2 fold at the moment. Firstly it’s formation. What I’m using (4231-2) now has been a really good for me, and I seems to have a reasonable team so I’m not looking to change it too drastically for fear of it falling to pieces. If I was to changer players in varying positions too much it’ll affect chem of others so bar upgrading current players to the top versions of them (or icons). Secondly, it’s my coin balance. I’ve got enough at the moment if I sold everything that I’d have approximately 3.9m, which will ‘should’ be enough for my ultimate target of r96 upon the release of the sbc if it’s in the 3m region as I anticipate. My hesitation to buy any large cost players at the moment is caused by the losing of about 1m in holding prime cruyff into toty so I got burned hard on him and don’t want that to happen again and end up being short when r96 drops. At the moment I can keep cruyff and Raul AND will be able to add r9 to the team, so don’t want to jeopardise that. I could sell at the moment and trade some more, but I’m feeling kind of burnt out with Fifa and ut to tell the truth, so this will likely be my last year of taking it seriously and playing as much as possible, so going to use a best team as possible at the moment. It’s such a shame it appears to be going downhill so rapidly and has become more of a ‘must play’ situation rather than ‘want to play for fun’ type thing as it used to for me. Haha yeah I got to 17 because I smashed 15 games Friday night and the rest Saturday morning. I’ve got 3 to go though, last time I got to 18 I reached 17 with 5 to go and only got 1 one win so I’m doubtful I’ll get 1 or even 2 wins if I can finish them off as it’s quite late, but I’ll likely try to the detriment of my sleep tonight! What was the red you got from last time round? It’s crazy as I’ve seen people get ronaldo from a silver finish and my best was from g3, yet getting g2 was pretty average for me although I did get an 86, so at least some fodder for future sbc’s I guess. It is comments like these which remind me how old I am. I thank you for that timely reminder. You know, I was wondering where you'd been recently. And then you EXPLODE with this epic confession! You are definitely deep, deep in the FIFA vortex. Let's see if we can take these points and break them down one-by-one. I just suggested Mbappe cause you asked. His NIF is nearly as good, and I don't blame you for not being bothered about it. Just a card you should try if you have the inclination and coin - kind of like Prime Cruyff. Who I also lost about a million coins on. Thankfully, I had just made a million (on Eusebio) when I bought him, so I didn't sweat it too much when i ended up selling him. 4231 wide is a great formation. I played a bit of that this year. 4411 and 442 and that formation seem to be the jam for me - and you, too. So, stick with what works. I keep messing with formations only to come back to one of these, which just goes to show if it ain't broke don't fix it. As for coins and R9 - I genuinely hope that is the going price for his SBC. As I've mentioned elsewhere, I'm quite shocked by the prices thus far. 3m for that card would be very fair, and I hope it happens, and I hope you get him. Burnt out on FIFA? You don't say. And your solution is to.... play as much as you can this year? I can definitely understand wanting to use your millions while you have them. I'm not in a totally dissimilar position myself - without something really, really epic for next year, I don't know how horned I will be. I just hit 500 goals with the Goat, and while it is and has been great fun, two years in it is beginning to feel a bit stale. I'll always love gallivanting with the goat, but the time, effort, and frustration that comes with it is increasingly less worth it. I promise you, take a week off from WL and then just look back at your weekend. Sure, Thursday morning is a little less exciting. But your weekend will just be so much more wide-open and stress-free - it's kind of absurd. Like I said, life commitments FORCED me to back away, and I probably wouldn't have otherwise. But if I somehow had a free weekend out of nowhere, there is no way I would play 30 games - none. Interestingly, I stopped at 11 wins last weekend (caught fire on Monday) - only getting one red card for the first time ever.... and it was my biggest pull yet: 89-rated Higuain. Just goes to show it's not where you finish that matters - it's PURE luck. I have opened approximately 24 red pick-ems up till now and never gotten a card that high rated! That's 70+ cards to pick from three months of Gold 3 finishes only to be outdone by a Silver 1! I couldn't make this **** up if I tried. The Goat has passed the 500-goal mark!!! What in the **** am I supposed to do about this new PRIME ICON MOMENTS Henry?!??! It's the most infuriating combination of scorn and horn I've ever felt in my feefing life!!!!!!!!! I have done SBC Best. Atleast you're not alone, we're in this together. Thank you, mate. And I am actually genuinely sorry for you - who would think that a Prime would one day NOT be a Prime anymore? That's so bogus. I hope you - and everyone else who did Prime SBCs - gets a way to use them for these new cards (somehow, some way). I was literally gonna buy Henry today but luckily held off. This has to be the most f’ed thing I’ve seen from EA do yet. And that’s quite an achievement. I'm really glad I'm not the only one who was shocked by this. So many people are willing to let EA off the hook for a shiny, new card. And, yes - it looks cool. But the timing is just so predatory - couldn't they at least NOT do the Icons who've had an SBC thus far and at least make it a bit more sensical and fair? The GOAT forum has decided to forestall any major decisions about the new Prime Goat. In the meantime, here's hoping we get a Pires or Bergkamp (or maybe Ljungberg?!?). I just hit 401 goals with my GOAT. Now they are releasing a Prime Icon Moments Henry. How much do you think he will go for? I will gladly sell my Prime Henry, Bergkamp and Pires to get this new Henry. I still think it will not be enough! Maybe I'll just stick to the original Prime Henry. I'm so confused! Ok I've found some information mentioned by forumers Milner and Wonderfulwest. Credit to them for the research. So the evidence suggests the prime icon moment is from his baby era? Explains why it's a different card entirely. It's the LW with a +7 and shifted to st.
Futhead are using the baby picture at the moment. So I'd imagine it has the baby in game model. Double winning season, league top goal scorer and also scored 32 in all comps. Not to mention this was his first silverware with the club, so makes sense that 01/02 was his prime club moment. This was when GOAT announced himself as the man at Arsenal. I might just keep my Invincible GOAT. Here is a side to side comparison with the old Prime GOAT and new Prime Icon Moments Goat. It is mostly +2 and +1 to all his stats. Still not sure whether the new card will have different work rates compared to M/M on the old Prime. 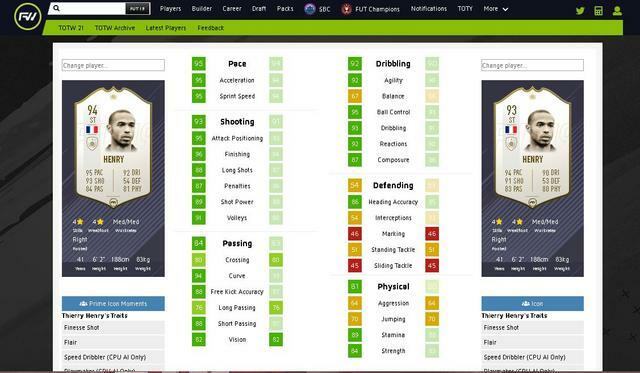 I've added the link to the Futwiz comparison between the two because my picture editing skills are a little off. You getting Optimus Prime Henry @James Libby ?